This section of the way is packed with variety - from coast to moor, roads, fields, but always easy running and nice open views of a very pleasant part of the country. Note: route is totally rural - no shops. Until now I've made the mistake of assuming the trail-running season lasts from about March to October. The crazy December of 2010 would back this up! However it is now clear to me that some of the best days of the year to be out on the trails can occur in the midst of Winter - I'm thinking bright, frosty, still, yet no midgies (!) and the boggy bits are rock solid. That's almost how it was when Lucy and I ran this section of the Southern Upland Way. Cockburnspath - now there's a place I'd never been to. 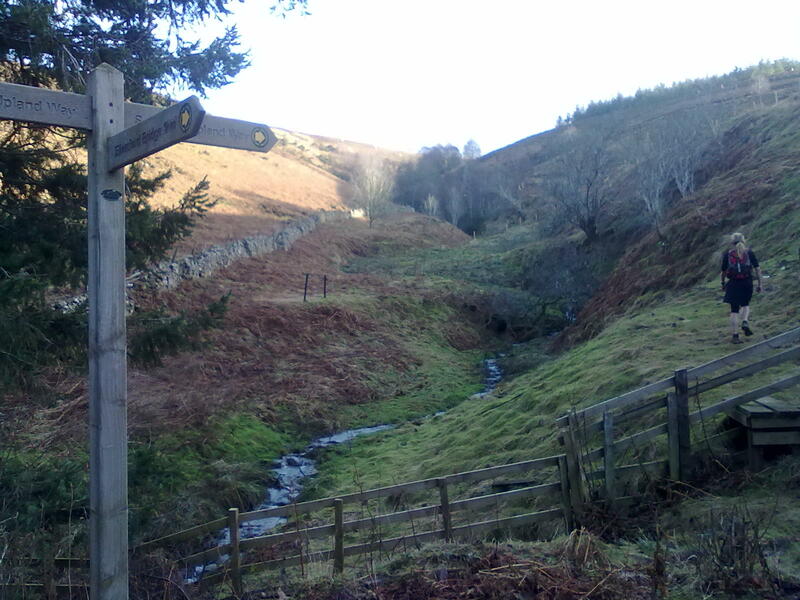 Well I have now, that's the starting point (or the end of the Southern Upland Way for most). We made good use of the local shop before heading off towards the coast. It was nice to take in a couple of miles along the cliff-tops before descending to Peas Bay and starting to head inland up a nice den, all very pleasant running. We did have to cross over the main east-coast line and the busy A1, then up a lane onto higher ground and grazing country, views opening out of the surrounding rolling hills. Lots of running through fields, hopping styles, and waymarker spotting (the route is very well signposted). Dropped down to Whiteadder Water and the hamlet of Abbey St. Bathans where a hunting party was getting ready to set off. From here there's a very pleasant run up a glen and through the trees before more rolling hillsides and views. Although the route is always at modest altitude it does have its fair share of ups and downs along the way - which was fine for us, we didn't come here for a boring flat run. After Longformacus, another small hamlet, there's a couple of miles of road-running along a lane which gains height easily up to the Watch Reservior, and so the scenery changes yet again as we climb up into moorland with extensive views of the Chieviots and border hills. The highest point of the run (shown) is the Twinlaw Cairns at 447m, followed by a nice prolonged and gentle descent. But there's still plenty more to see as the route drops down into hidden, shallow dells of Blythe Water. Be prepared for a few cheeky climbs towards the end of this run before reaching Lauder. Also be prepared for the temptation of a few cheeky pints on arrival to this great wee place, or just settle for coffee and cake like we did.